For those of you who don’t know who Invader Zim is, picture the illegitimate offspring of a 3-way between Ren, Stimpy and Marvin the Martian and you’re probably in the right ballpark. Zim has been dispatched to Earth by the leaders of the Planet Irk (essentially to get him out of the way), with his trusted sidekick Gir (a malfunctioning robot), to conquer the human race. Standing in his way is his very own Fox Mulder, Dib Membrane. Oh, one other thing… Zim is the size of a child, so the ‘only’ way he can infiltrate our society is to pass himself off as a human child, with a disguise so clever Superman himself wishes he thought of it. He puts on a wig. 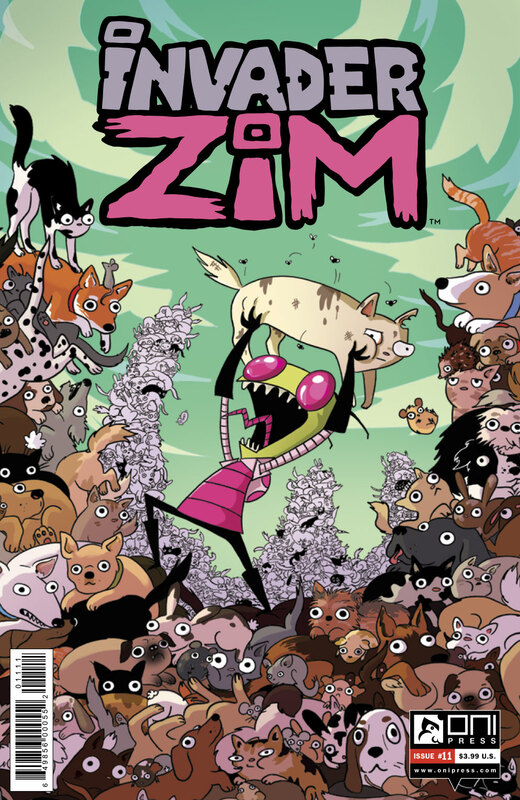 In this issue, Zim is once again locking horns with his classmate Dib in his never ending quest to enslave the human race, with Gir (who is suffering from acute kitten loss), once again by his side. The beauty of this type of book is that you don’t have to read all the previous issues to pick up the stor, allowing readers to jump in at any time and enjoy the maniacal fun. Creator Jhonen Vasquez is helming these continuing adventures of Zim in its new home at Oni Press, and under his direction the wrathful little alien is at his devious best. Sarah Anderson’s artwork translates the TV show beautifully to the page with none of the anarchic qualities of the show being lost along the way.